Julie has practised family law since 1989 in Chesterfield. 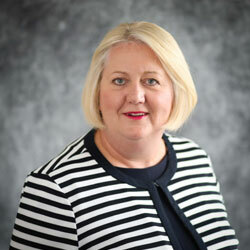 As well as being a Resolution trained mediator Julie is a Resolution Specialist Accredited Solicitor with her specialist areas being disputes between parents regarding their children on separation and financial issues arising from marriage or cohabitation breakdown. Having worked in the area for in excess of 20 years, much of Julie’s work comes through personal recommendation. Julie has experience of all aspects of relationship breakdown. Divorce or relationship breakdown, where there is substantial property holdings – often including properties overseas. Advising parents regarding arrangements for their children including where the children should live and how much time they should spend with the other parent. Assisting grandparents who want to spend time with their grandchildren. Julie is a Member of Resolution and a Resolution trained Mediator and Resolution Specialist Accredited Solicitor. Resolution (www.resolution.org.uk) campaigns for the improvement of Family Law and the Family Justice system and is committed to developing and promoting the highest standards of practice. As well as having a family Julie is Parliamentary Liaison Officer for Derby and District Law Society and spends her limited spare time cooking, going to the cinema and taking holidays at home or abroad..